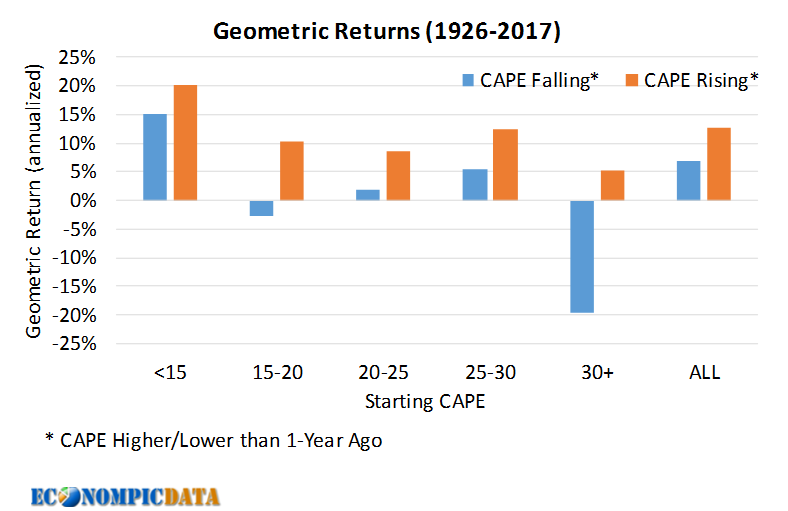 Contrary to theory, the market P/E level does not primarily reflect future prospects. It reflects current conditions. Go read the whole thing, but inputs into the model include profit margins, inflation, volatility of GDP, a reflection of recent market performance, and 10 year treasury rates. The more investor friendly these inputs have been, the higher the multiple of the market. Given where we are in the cycle (high margins, low economic volatility, strong recent performance, low rates) investors have pushed multiples to elevated levels. GMO has not attempted to predict future prices or performance with this information. Our model does not attempt to justify the P/E levels as logical or deserved, nor does it attempt to predict future prices. Rather than rely on their model which I don't have access to, I simply used the CAPE (cyclically adjusted price to earnings) given the strong enough 0.9 correlation to their model (which was only off during the late 90's bubble when the model underestimated investor risk appetite and interestingly enough a few years back when it overestimated investor sentiment). Using S&P composite stock market data going back to 1926, I divided the data into 5 specific valuation buckets (starting CAPE of less than 15, 15-20, 20-25, 25-30, and 30+) and split this further by whether the CAPE itself was higher (multiple expansion) or lower (multiple contraction) than where it was 12 months ago. This is going to be VERY similar to trend analysis, but there can be differences (i.e. 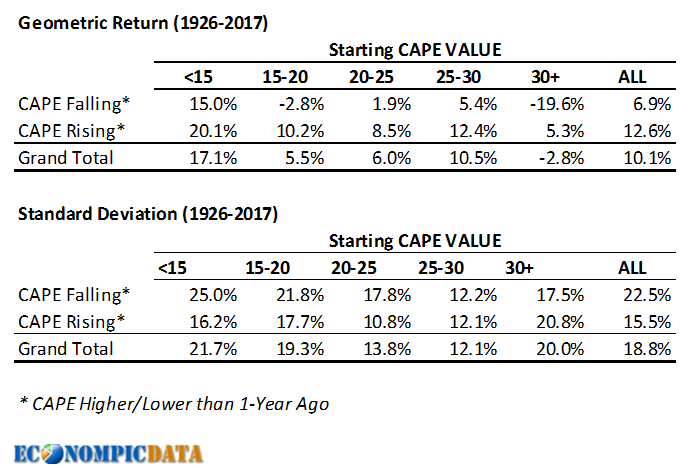 there is the possibility that multiples can contract even if returns are positive, especially at low valuations when earnings yield is so high). I then took a look at the next month's performance and annualized the applicable returns for these buckets. The takeaways are pretty clear to me. Invest in stocks when they are cheap or multiples are trending higher and when rich (i.e. at current levels) tread carefully, look to allocate to cheaper areas of the global market (GMO's commentary had a great case for emerging markets), and get the hell out of the way when profit margins, inflation, volatility of GDP, or 10 year treasury rates reverse course and multiples start to contract.